on special display at the V&A Museum. This wasn't the easiest of days for me! Met for breakfast in the hotel dining room at 8:30, then went to the Tate Gallery to check out artists JMW Turner, William Blake, Salvador Dali, and a few pre-Raphaelites. We ate lunch at the Tate. I couldn't find my tube pass at the underground station, so we went back to the Tate. From there we took a cab to the cybercafé I used in Bloomsbury. After fiddling, I finally got my website changed and pictures posted for the first two days. I also explained why we hadn't posted anything and told people I couldn't promise to get back to them. Cindy, Kevin and LeAnne also used the time to send email, including a help message to Jo, our wonderful travel agent, regarding the tube pass. We enjoyed looking at the Elgin Marbles at the British Museum. We also tracked down the Rosetta Stone and some Celtic displays. The Sutton Hoo area is being refurbished so we only saw a couple artifacts. When we sat down for lunch I found my missing tube pass jammed inside a guide book, so Kevin made a quick call to Jo to let her know. We went to Leicester Square (Chinatown) to find the Golden Harvest Restaurant. We almost gave up, but found it and had supper. The evening at the V&A would have been very nice if we hadn't been so tired. They had a concert going on in the main hall. We enjoyed a special presentation on tiaras and finished up by staggering around the clothing exhibit. Came home to shower and drop into bed. 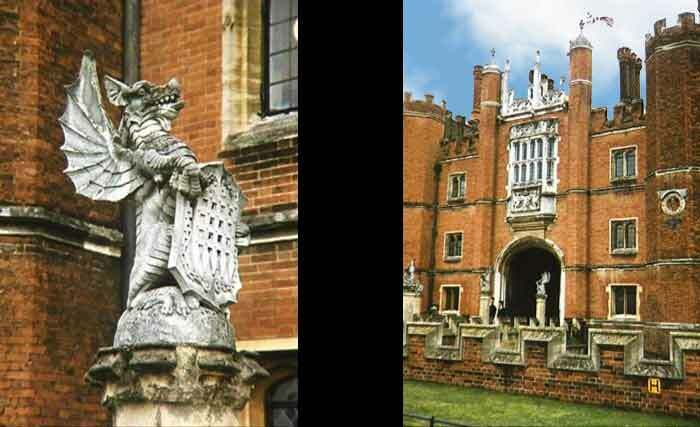 A wonderful dragon acts as sentry to Hampton Court Palace. Our favorite concierge Robert told us that we could get one-day extensions on our tube passes that would allow us to go to Hampton Court by train, so that's what we did. If we'd really wanted to, we could have gone for free. Just like the last time Cindy and I took that train, nobody checked tickets at any point. We hopped on the train at Waterloo and went to Hampton Court and back without a soul checking whether we'd paid. Scary. Hampton Court was gorgeous, of course. We toured the Tudor kitchens, which Cindy and I didn't do last time. An organist was playing in the magnificent chapel and it gave the place an extremely solemn atmosphere and reminded us that Easter was approaching. A view showing the fanciful Tudor chimneys with the Great Vine in front. Then we took the guided tour of the King William's apartments. Our guide didn't impress us much. He was too wrapped up in explaining the protocol for seeing the king to explain the building itself, its history, the artists, the architecture or mentioning the fire that nearly destroyed it 15-20 years ago. The restoration work was admirable, and he didn't mention a word of it. Our guide last time did all that and more. We were glad to ditch this fellow and explore the rest on our own. We ate lunch at the restaurant at Hampton Court. Since I had leek and potato soup last time I was there (yes, I remember!) I had the tomato and basil soup this time. I'd noticed that those two soups appeared on menus regularly. Then we toured the gardens. Kevin and I were wishing we'd had the time to take the offered carriage rides out on the grounds, but we had loads of fun walking among the flowering trees, blossoms and shrubs. 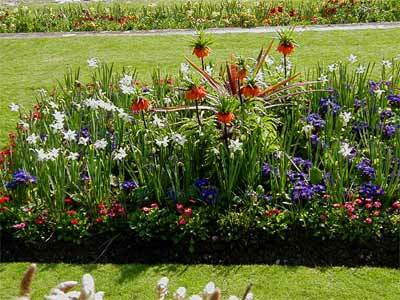 Despite the fact that it was the same time of year, the gardens were planted with different flowers than our last trip. We found a path leading back to the banqueting house on the far side of the Privy Gardens, so we got some interesting photos looking back at the palace from the other side of the gardens. Cindy reminded me to snap a shot of the 'H' signs that we'd noticed last time. We'd asked a guide about them then and he told us, with a gleam in his eye, that those were bricks placed in the building by Henry VIII himself. Since that part had been built long after Henry was dead, we didn't accept that explanation for a moment! It turns out they marked where fire hydrants are located. 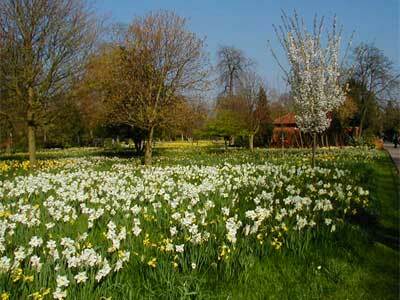 The same guide had mentioned that we needed to see the Wilderness Garden as it had "a million daffodils" in it. He wasn't exaggerating. After seeing it, we agreed that we should have gone back and told him he'd miscounted. Cindy and I were eager to show LeAnne and Kevin the "million and one" daffodils in the wilderness garden, and they were suitably impressed, moaning over the amounts of film they were using. We didn't get to the maze. As we were walking away, we all agreed that one could spend a lot of time at Hampton Court; much more than we spent. We walked to St Martin's Theatre and sat down for 'The Mousetrap'. The acting was good, but the two sitting next to me did the roles just as well or better. I really enjoyed looking over to observe Cindy and Kevin's delighted expressions. It was great!